As I reflect on the past ten years and what I personally took away from that sad, fateful, awful day, is that people are intrinsically good. When tragedy happens and happen it did, people tend to step up and pull together for the greater good out of kindness, survival and love. The morning of September 11, 2001 was much like any other morning for me. I drove all three kids to Stuart Middle School, the only year all of them were there together. At the time I was a Volunteer Coordinator and spent a lot of time at the that.”>school that morning was no different. School started around 9am back then, so we were probably there by 8:30am and I was in the front office when the first plane crashed into WTC1 North there was shock all around. I am not sure if it was after WTC2 South Tower was hit that the school district went on alert and had to decide if the kids would stay in school or not. It all happened pretty fast and everyone was scrambling. Then the Pentagon was hit and Flight 93 went down. It was definitely a scary day in America. As a parent of three kids in the same school, where I happened to be when it happened, watching how the school handled it, I made the decision to leave my kids at school. The district excused kids whose parents wanted to pick them up, but I thought the more normal of a day my kids could have would serve them better than coming home and watching it all on TV right away. I also had the perk of going to each of my children’s classrooms to make sure they were OK with staying. 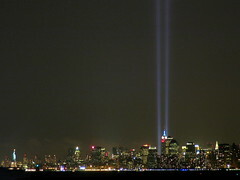 The evening of September 11, 2001 was eerie – there was absolutely no air traffic in the sky until Sept 13, 2001. Being in the aircraft industry, and always near an airport, noticing planes flying overhead all of the time, the feeling was unsettling at best. I remember thinking, this changes everything we have ever known about being free and protected at the same time. What an understatement that thought turned out to be. The next few weeks, and months I couldn’t peel myself away from watching and listening and trying to figure out how this could happen here in the USA. We have the best defense systems, how could they have failed us that day. I am not one to speculate and come up with theories from media reports, or even what I am being spoon fed. I personally like to do my own research, take all sides of an issue into account and form my own opinion of what I believe. With the events of 9-11 I read just about everything I could, I watched hours of footage and listened to even more hours of interviews, and sounds from that day. I am not really sure what I believe at this point, but I will say, something isn’t right with the story that has been portrayed. Logically things just don’t add up. I am not a 9-11 truther, I am just someone who thinks the whole story has not been told and will probably never be told. I haven’t dwelled on this and I won’t ever dwell on it. It isn’t in my control and it won’t change anything. I just revisit it around this time of year since that day. The tears flowed, feelings of anger and sorrow also crept in, but in the end love took over my feelings. I decided that a loving state of mind was where I could do the most good. My first flight after 9-11 was also in 2003. It was with dear friends to the Bahamas. I went because my girlfriend was still deathly afraid to fly. I wasn’t afraid, but I can tell you it was a weird feeling being in a plane again after 9-11. I was definitely more aware of my surroundings and paid more attention to people I probably would have never given a second glance. I guess it made me a little suspicious, but I think people who are survivors and survive events have to have more of an awareness about them. I never gave it a second thought before. Flying back then, to the Bahamas, you still didn’t need a passport, you only needed an ID and birth certificate. Boy how times have changed now. From then until now, I have flown several times. I am not really bothered by the security. I don’t like the idea of being radiated when I go through a scanner, but if I am going to fly it is a price I have to pay for that choice. Flying by the way, is a choice. If you don’t like what you have to go through to fly, then don’t fly. I think the biggest lesson that still resonates with me is, I won’t stop living my life to the best of my ability as a kind, loving, compassionate person, and I won’t stop trying to do the best I can, to be better each moment I am here. No matter what obstacles are placed in front of me, I will always look for a way to make my space better than I found it, make the people I come in contact with feel loved and appreciated, and not dwell on things I have no control over. We never know how long our time here will be, and as 9-11 taught us, it can be gone in an instant. Tell the people you love, I love you every time you see them, hold them close, and try to always be kind. When parting ways, if just for the day, or in some cases longer, understand that it could be the last time you see them. Live for now, love forever, and be everything you wish to be. There is no room for past regrets and lost moments when you live your life in the present.